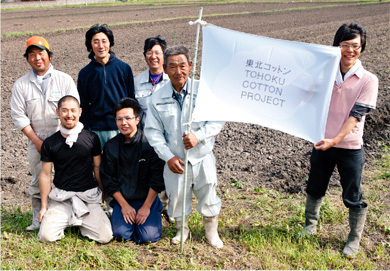 90 percent of the 76 hectares of land owned by the Natori City Agricultural Corporation was damaged by the March 2012 tsunami. Immediately following the earthquake came huge waves of mud that engulfed the land, turning once cultivated fields into piles of rubble and debri. The ‘Koutani’ (ploughed valley) became a ‘wasteland’. 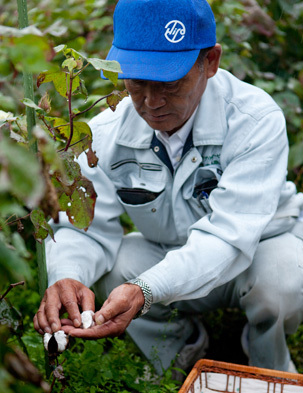 It was a period of great hardship and we had just begun to agonize over ways the land could be restored to its former condition when in May of the same year, (legwear maker) Tabio Corporation asked us if we would be interested in planting cotton. The suggestion was based on the hope that cotton could be planted despite the heavy salination of the land. Because we are a corporation and have employees, we needed to consider whether there was a sound financial basis for this. But on the other hand it was agricultural land that couldn’t be used for anything so we decided it was best for us to act and do something. Planting cotton meant that we had to begin by removing all the rubble and debri and then turning the land. Getting the land back to a state where it could be used again was the first step so before money and profits, we just gave it a go. Initially we talked about just using a small piece of land to try it out. It all had to be done by hand and it was our first time so it was a bit of an experiment. We sowed seeds on just one field. After a month we were able to confirm that the seeds had all sprouted and were thriving so we began cultivating a total area of 40 acres. The idea was proposed to us, we took it up, and we had carried out the initial steps, but I didn’t really get enthusiastic until I saw all those green shoots sprouting up out of what had been a wasteland. If we were going to do it properly we had to push forward with a proactive mindset or we wouldn’t get the results we wanted. We needed to take ownership of it, establish it as a business objective, apply governance, and take control. From then on, we grabbed the bull by the horns and took cotton on with full commitment. A farmer’s biggest joy is harvesting his crops. The harvesting of cotton begins after the cotton has blossomed and the cotton balls have opened. The harvested cotton is so warm and as white as snow. I was a victim of the disaster and somehow seeing this cotton made me very emotional. Around these fields there were people that lost their lives in the tsunami and thinking about that brings me to tears. The catastrophic nature of the March 11 disaster will never be forgotten and it is our hope that the cotton we produce here honors the lives of those lost in the tragedy. In some places people have planted cherry blossom and other trees in memory of lives lost. For me, the growing of this cotton carries the same emotion. Now in our second year, we consulted our staff and decided to expand the cultivated area to 1 hectares, an amount that is manageable and for which we can still take full responsibility. At any rate, not getting results would be showing a discourtesy to both the project and the cotton itself. We are therefore reviewing our last year and making changes to areas that need improvement. 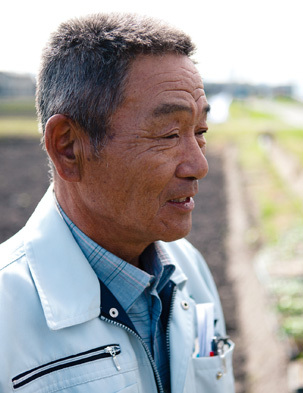 A year after the tragedy 70 percent of the farmland has been restored. Thanks to everyone’s hard efforts we were able to plant rice for the first time in two years. We are a rice-producing agricultural community and being able to plant rice gave us a sense of contentment and peace of mind. Last year, at a time when we just needed to get going and get the land back to a useable state, cotton gave us courage; gave us the motivation to keep going. Without hard work the land would have remained a wasteland. We needed to accept what had happened and figure out how to move forwards. The people that could needed to work, needed to stay positive, and motivate each other. Considering what we’ve been through we’re a pretty energetic bunch (laughs). You never know, maybe the cotton gave us this energy. Either way the cotton project has led to interaction with an array of people and endowed upon us a fortune that can only be felt and not seen.